Recently, one of my g'babies was feeling pretty sickish and I found myself falling further and further behind with my agenda as this baby requires extra loving when he's ill. There was a lot of sitting-holding, standing-holding, lying-around-holding as I tried to console his senses and make him well. It was a sort of novelty for me as I'm not the sort to give up my agenda so readily. My preference might have been to do working-holding but that would have divided my attention too vastly to meet his needs. Novelty, for real, because I'm generally too selfish to put other folks's needs ahead of my own. I say this sort of thing out loud sometimes and friends tell me it's a ridiculous notion, but regardless of the words I say or put on paper, I still know me better than the "public" does. Anyhow, there was this moment when I was brushing the hair across his brow and whispering lullabies to him that a thought occurred to me: I would take this on for you if I could. I would be sick on your behalf if it were possible. I'm sure that in all my years of mothering, wife-ing, friending, I must have said this before and probably more than once but I don't think I've ever felt it so intensely or so intensely understood the implications of such a statement as I did in that moment. What we're talking about now is sacrifice. I would take it on (whatever it is) so that they might live more freely, more abundantly. That's when I start to wonder just how far I'd go, how much I really would give up for the sake of those whom I love. I like to think I'd give it all but I've not faced that kind of reality. I begin to reflect on 9/11. It's hard, I know, but you do that too for just a minute. Stop and think about the hundreds of men and women who gave their lives on that day in the service of others ~ who gave their own lives so that others could live. Now. The astonishing fact is: One Man gave His life so that every single one of us might live. What we're talking about now is love. He requires nothing in return for that except for you to accept the offer. Dear Jesus, I fall so short of my goals and so often. Thank You for loving me anyway and for giving it all so that I might live forever with You. *I must acknowledge that sickness is a fact of life and so are burdens and that a purpose may be served through it all. There is so much that I actually would not take from those whom I love as I've seen the growth and wellness that is possible to achieve through hardship. My husband occasionally asks if we have too many toys and my answer is usually a resounding, "No." However, on one of these recent days while I was all alone in the house, I saw a slight absurdity at my entrance-way: it generally takes about five minutes to open my front door, should anyone come to it, because I have to rearrange the "stash." Cool, right? One blank sheet where I could make a note. It's obvious that children play here. I now have four g'babies: two pre-school girls and two infant boys. When these guys first started coming at me those few years back, it was more than just a slight shock to the system. Honey and I had barely experienced the empty-nester phase. The years previous to that (the time since we'd blended) had been tumultuous to say the least. There was always good. We were (almost) always (trying to be) grateful. But raising our kids to adulthood was a feat and we were ready to rest. Things don't always turn out the way we'd planned or hoped, huh? During the past four to five years, my life has been pretty much centered around g'babes. Honestly, it's not something I would have expected at any point in my life, really. I've never really understood kids and certainly never thought I'd have a preference for their company. What was the alternative, however? This was the path that unfurled before me. These past four to five years have been as tumultuous as any previous period but there's always good. We're always grateful. Even now, as things are once more not how I thought they'd be. These days, I hardly see my g'babes. True, that's "hardly" by my standards but it's still an accurate depiction. True, it's partly due to the natural process of life but there are other factors that I can't tell about. Those parts belong to other people and I must let them tell their own stories. Also, there's some hurt and it's just hard to talk about. When the new babies first started showing up, when our lives first started to shift, what did I lose that I'd anticipated so much before all my kids were gone? The hours and hours of quiet time, perhaps? The clear path to the doorway? A notepad with more than just one clean sheet of paper? I wouldn't trade those babies for any of it. For anything. Thinking back on my mothering years, for all the mommy dearest that I was at times, for all the coulda-shoulda-wouldas, I'm just grateful to have had them. And the meemee years? Thank you, God, for each day with a g'baby. Maybe I haven't gotten the life I would have planned but I'm grateful for the life I've gotten! Would I control it more if I could? Would I develop and execute the most appealing plan? Well, who wouldn't, really?! The thing is, though, that life happens by a series of events over which I am powerless. I totally admit it. I also totally know that God, however, has the power to work it all out. This post happens not to be about the addictions and compulsions that I seem always to be facing but the twelve steps are still relevant and restorative. One Step and then the next and then the next. Sometimes we start over. "We are never more than one generation away from apostasy." I can't seem to determine the precise source of this statement but I'm in a hurry to put this down. I like to give credit where it's due, but sometimes, perhaps, it's more important to be timely. I actually considered calling this one, "One is the Timeliest Number." Anyhow...know what apostasy is? It is, according to dictionary.com, "a total desertion of or departure from one's religion, principle, party, cause, etc." 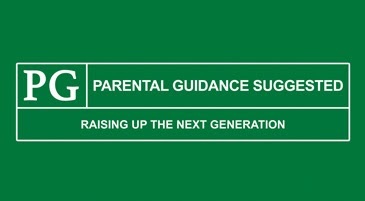 My congregation* began a new series this morning called Parental Guidance: Raising Up The Next Generation, and I'm stoked. While it's true that my own kids now have their own kids, and true that what's past is done, there's still a new generation coming up ~ one that needs guidance and good examples ~ one that stands to be a very lonely generation if they don't know the LORD. There is a new generation and they need us to raise them up. There was a Whole Lot that resonated with me this morning, but there's one particular point I'd like to share. Over these few years that I've been involved with my congregation, I've seen a lot of things change. Some of it was hard for me to accept (cough, "contemporary service", cough, "casual attire", cough, cough), but I've warmed to most elements of our evolution. I should think it would be hard not to come around when so many new folks - and especially children - are coming around (to church now.) My pastor gave me a good, little reminder this morning. The message does not change but it is okay for the method of delivery to change. What's important is that we get the message through to the next generation. Worship service videos can be viewed here after a couple of days. Worship services can be viewed live via webcast here. This picture was taken on Christmas morning and promptly posted to Facebook. This picture possibly received more 'likes' and positive comments than anything else I've posted. And each such comment causes me to snicker cynically. Sorry, folks. Just trying to be honest here. They say, "a picture's worth a thousand words," and I can go along with that, but what does this particular one really say? To me, it says that having us all in one room, so close together, all smiling so gleefully is an astonishing feat. But then, I'm reading it with a bias ... as one who knows the back-story. I happen to know how much anger and disappointment and hurt and frustration and dysfunction is contained within this frame. I know how hard a year it's been, how hard it's been to bring us all together, how hard it is for us to smile when we're all in one room. However, believe it or not, this is not a pity party. This is not me telling you how bad things are around here. This is me pointing out that things are not always as they seem. For all the "perfection" that a picture can portray, there is always something behind the scenes. Something you don't see. Something you can't know unless someone tells you. What I'm telling you is that my family is not perfect. There's good here even if there is some bad behind the scene. It really is a beautiful picture. We really are blessed. I think I'll focus on that! Some folks might say I've used this for some kind of divine photo op. Okay. Maybe. Some might say that I'm hanging all my laundry in the yard. Okay. Maybe some of it. But what I mean to be is telling you to look very closely and consider very deeply everything you see in life. *I have folks and a sister and a niece who reside elsewhere. And cousins, and in-laws, and, well, more family than is pictured here. *Also, that blur at the bottom of the picture is my cat. Where Have All The Good Words Gone? Once, on a whim a few years back, I decided to draw. Serious stuff: I bought pads, pencils, and fat, grey, official-artist-looking erasers. I’m pretty sure that “artist” was on my list. You know: the third-grade “What do you want to be when you grow up?” list. Maybe not in that order, but I dreamed of manifesting myself in every one of those occupations. It seems reasonable that “writer, author, story-teller, world’s greatest blogger” would be somewhere on that list, even if farther down, right? It’s not too high a goal, right? Of all my dreams and goals and fervors, I think I’ve never had such a need to follow through as I do for writing. Looking back, I see I’ve always done it. Wrote that one in just one afternoon to soundtrack my couple of hours of jumping off the bed into a pile of laundry. I was the bomb. Later, it was poetry ~ some of it sweet, most of it dark, nearly all of it private. Generally, I’ll take a shot if it interests me and then I’ll generally grow bored and quit. Understand that I’ve no inclination that I’m carrying the great American novel in my heart or that my memoir would touch and change lives forever or that I might write words to change the tide of history. It’s not that I think my writing is good or important or even read by people! It’s that I need to do it. And these last few months have been hard because I haven’t been able. Great things come to mind. Drafts develop. Inspiration and excitement ensue. And then all of it dissipates rather quickly. I keep reviewing my year, looking for answers. There’s a pattern that only I may recognize. (Or so I’d like to think.) There’s a lot of stuff betwixt my lines. There’s so much behind the scenes that, as much as I might like to run screaming it through the streets, too many standards prevent me from sharing. And then I have to consider the possibility that I am simply done. It’s not that I’m bored because the urge to write things down is sometimes the only thing that moves me. But maybe it’s supposed to be private. Maybe I’m not supposed to write it publicly. Or maybe I’ve said all that I’m supposed to SAY. I just really hope not. And that I will follow through when He does. Is this piece it? The follow-through? Nope. But it is an attempt to revive my fervor. I really need to write. And to close, I hope only for now, here’s a really cute video that I found while perusing just last night. Obviously, I didn’t write it ... but I sure do wish I had!